Kitchen in showing apartment, decorated with possible ideas for your future home. Photographing model apartments can be great fun when decorated well, this one is great. Shows so many great ideas for decorating. 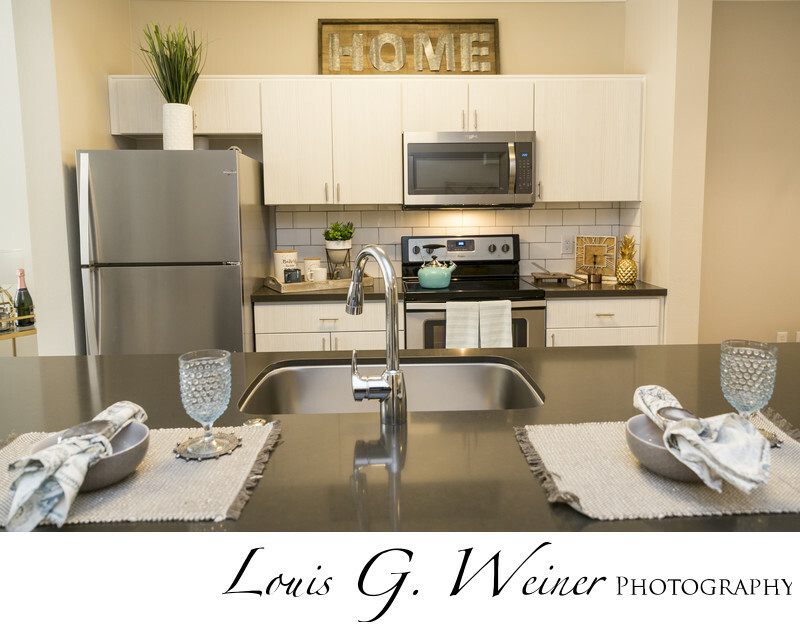 Photographs of newly renovated Victoria Arbors apartments and homes, this is a great place to live with beautiful rental apartments. What a wonderful place to live in Rancho Cucamonga, with outdoor areas, pools, a gym, all the things you would expect at a luxury rental. Every aspect of living, a great place to live. Architecture photography is one of my favorites. Capturing the light or creating it to highlight the beauty of a location. Showing all the best of the location so others can see it and love it. For the architect, seller, or Rental agent, it is a pleasure to help you show what shines about your property. You can see more of my architectural work on Houzz, https://www.houzz.com/pro/louisgweiner/louis-g-weiner-photography . I have the honor of most of the images on the Victoria Arbors website being my captures. Location: Vitoria Arbors Apartments and homes, 7922 Day Creek Blvd, Rancho Cucamonga, CA 91739.